These poached pears contain no added sugar as they are naturally sweet and juicy. 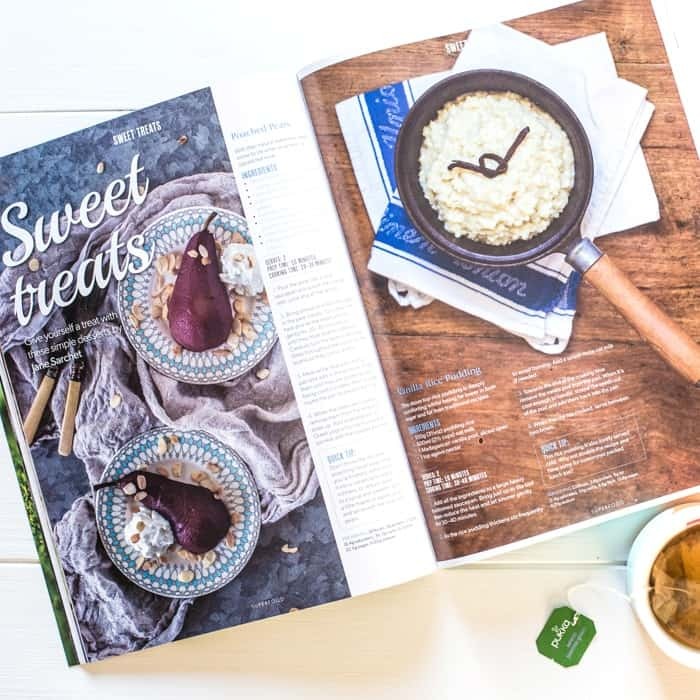 Read on to hear about the entire collection of no added sugar dessert recipes I wrote for this months Superfood Magazine. Just in case your resolution of early January has faded a little by now, I’m here to bring you quite possibly the cleanest version of poached pears ever! I originally wrote this recipe as one of six sweet treats for the winter edition of Superfood Magazine. It was the toughest brief I’ve had from them so far – each recipe had to come in below a strict level of fat and sugar and it made me realise just how much we rely on sugar in dessert making. So in this recipe I’m relying on the sweetness of the ripe pears, adding red wine and spices to create a dessert that is naturally sweet and absolutely delicious. If you want to take a peek, you can find the latest Superfood Magazine here. Pour the wine into a small saucepan along with the orange zest & juice and all the spices. Bring almost to a boil then add in the pear halves. Turn down the heat and let the pears simmer gently for 20-30 minutes, or until they have slightly softened. Carefully turn the pears over a few times throughout the cooking time to ensure they colour evenly. Meanwhile heat a dry frying pan and add in the almonds. Toast them until they are golden brown being careful to keep them moving round the pan to prevent burning. When the pears are cooked, remove them from the wine and plate up. Add a tablespoon of Greek yogurt to each plate and sprinkle with the toasted almonds. Top Tip: Don’t throw the red wine poaching liquid away when you’re finished, either pour it into a casserole to add a richness, or reduce down to a syrup and sweeten with a little maple or agave syrup and serve with the poached pears. I love poached pears and these look scrumptious!! The photography is just beautifully done. What did you use in place of the wine Bintu? I love pears in desserts! These look just beautiful – I love how you have shot them, those gorgeous purple pears against the pale turquoise plates, so pretty. This is making me drool on a cold winter’s morning. What a gorgeous recipe, and a gorgeous photo. Lovely photos! Poach pears are such a lovey dessert. Love the sound of your vanilla rice pudding too, need to seek out that magazine haha. Love poached pears!! Wine poached is my favorite and this is just the time to indulge in desserts like these! Beautiful Pictures… I love Poached Pears and you have potrayed them gorgeously..
That’s great Zizi, I hope you love it!